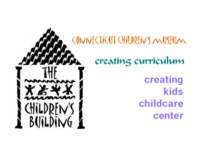 The Connecticut Children's Museum building houses three programs, interwoven in purpose and philosophy: Creating Kids Child Care Center, Creating Curriculum Child Care Provider Training Program and the Connecticut Children's Museum itself. Each is inspired by the Theory of Multiple Intelligences, articulated by Harvard psychologist, Howard Gardner. This is a rich and resourceful, cutting edge educational theory, which recognizes the multiplicity of children's intelligences and honors the different ways children learn. Children need a place of their own where they can experience the magic and wisdom of learning at their own pace by interacting with exhibits that are full of whimsy and wisdom, in spaces built to their size and specifications. Early childhood educators, working in a myriad of programs throughout the city and its suburbs, need a place to bring their children and a place where they can find support and inspiration. Families need a place of full of color, joy and community where they can play and learn together. The Connecticut Children's Museum is designed to be such a place.